This is a recent study on how the DRX 9000 spinal decompression table can help those suffering with pain due to herniated discs. With these staggering numbers, the DRX9000 True Non-surgical Spinal Decompression SystemTM was developed to provide an effective non-surgical treatment alternative for chronic low back pain patients. Furthermore, recent studies have demonstrated the DRX9000's ability to potentially decrease analgesic use for chronic low back pain patients. A newly published case report in Volume 2 Issue 1 of the European Musculoskeletal Review, demonstrates positive results utilizing the DRX9000 True Non-surgical Spinal Decompression System. 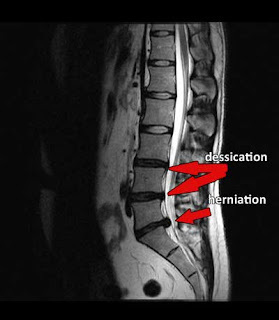 The report titled, "Managament of Low-Back Pain with a Non-surgical Decompression System (DRX9000) - Case Report" displayed the pre- and post-treatment MRI findings of a 69-year old male with low back pain. Prior to the DRX9000 treatment, the patient described experiencing low back pain radiating in both legs. When asked to describe his pain intensity on a scale of 0-10, the patient rated his pain intensity at 10. After completion of 22 treatments, over a seven-week period, the patient reported a pain intensity level of 1. What's more fascinating is the fact that four months after the initial visit, a follow up MRI revealed decreased herniation size and increased disc height at multiple lumbar levels. The authors conclude the case report by stating, "This case report further builds on previous findings that have demonstrated improvements in disc morphology after treatment with the DRX9000."